The superstitious Nords revere the ancient Dragon Temples whose arches jut from the peaks like stony ribs. They associate these places with events of the distant past. Skuldafn is one of the greatest of these temples, and thus one of the most sacred. 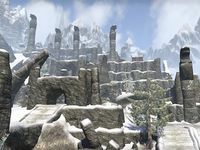 Skuldafn is a Nordic ruin on a high mountain east of Eastmarch. Skuldafn holds the only way for the living to enter Sovngarde. One of the last quests in Eastmarch takes place here. Skuldafn Objective: Reach the dragonshrine and stop Fildgor's vile plot. Skuldafn Wayshrine is located on the northwest corner of the ruin. 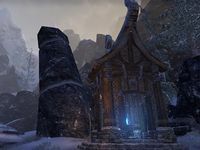 A door to Mzulft can be found in the southeast corner of the ruins. However, the passage is blocked by rubble. Skuldafn also appeared in Skyrim.